In this week’s edition of Botanical Roots, Loop News will look into the benefits of eating soursop and how it aids in staving off certain maladies that affect us. Soursop, the fruit of the Annona muricata broadleaf evergreen, is a popular treat in the Caribbean, Central and South America. The tree is native to the Americas, but is cultivated in tropical climates around the world today. Soursop can be eaten on its own, but it is more commonly incorporated into beverages, syrups, smoothies, desserts, ice creams and sweets. The flavour of soursop is quite distinctive, and can be compared to an apple crossed with a strawberry, but with an underlying sour citrus flavour. Soursop is a member of the custard apple family, so named because of its creamy feel, which is akin to a banana or a coconut. The Annona muricata tree can reach 20 feet in height and the fruit it bears is physically imposing. Soursop can easily weigh 10 to 15 pounds. Oval in shape, this unusual-looking fruit can reach up to a foot in length. Soursop pulp is loaded with potassium, vitamin C and dietary fibre. Unfortunately, it packs a sugary punch. One cup of soursop pulp contains 30 grams of sugar, which is why it should be consumed in moderation. 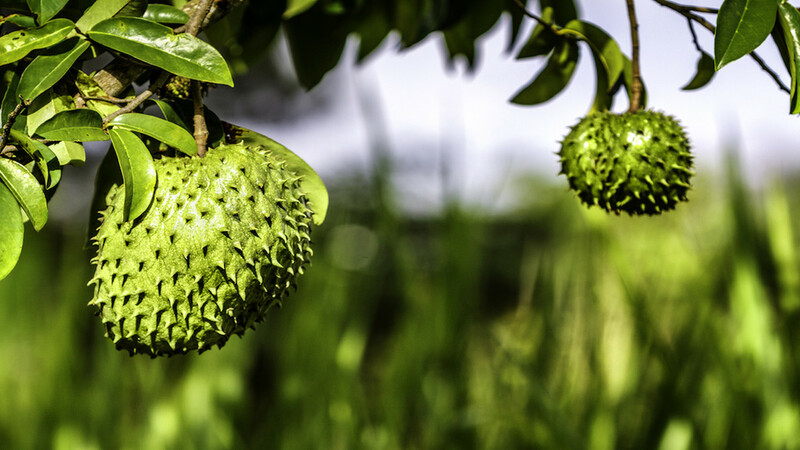 The soursop pulp is a key ingredient in many tropical desserts, but the leaves of the Annona muricata tree are what interest cancer researchers most. Soursop leaves have been found to contain a wide array of annonaceous acetogenins (AGE). These are a unique class of metabolites derived from long-chain fatty acids and have shown tremendous promise as a natural cancer treatment. AGE can be extracted by boiling the leaves into a tea, which is usually referred to as graviola. The chemical composition of soursop leaves provides other health benefits as well. When applied topically, soursop leaf extract helps enhance wound healing and reduce inflammation. Scientists have attempted to isolate the bioactive compounds of the extract, which has been shown to be effective at reducing the frequency and duration of tonic seizures. Extracts made from soursop leaves have shown amazing potential, but the fruit itself has much to offer as well. Researchers have found that the pulp contains the same chemotherapeutic properties as the leaves, seeds, roots and shell. Moreover, even after being frozen for a year, the pulp retains the powerful cancer-fighting acetogenins. The fruity pulp also packs a serious nutritional punch. 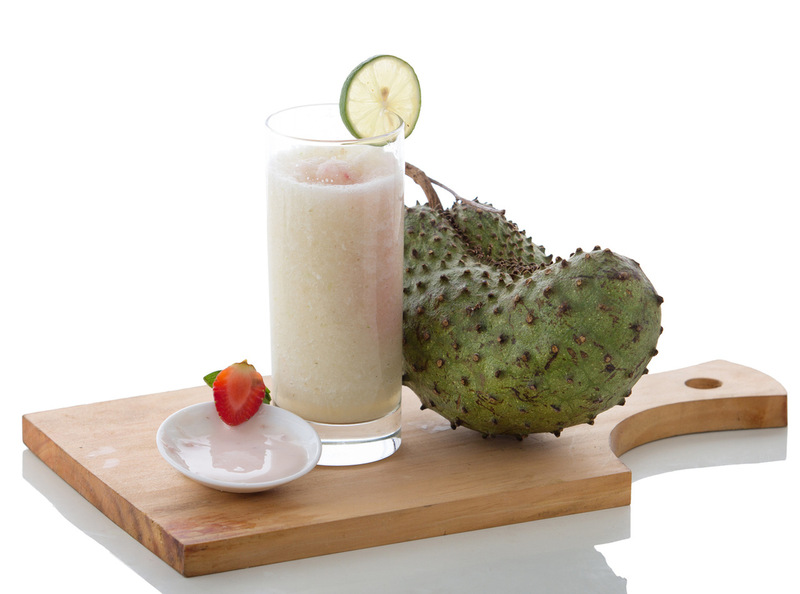 Soursop is rich in antioxidant compounds, which keep free radicals in check and help fight inflammation. A study found that this amazing fruit possesses anti-arthritic properties. Soursop also is laden with vitamin C, vitamin E, zinc and beta carotene. This potent combination can potentially protect you from eye disease and promote vision health. Researchers have confirmed that soursop can effectively combat parasites, tumors and a wide range of common health complaints. In tropical Africa, soursop is used to help treat coughs, pain and skin disease. A 2015 hypertension study found that a tea made from soursop leaves decreased blood pressure without adversely affecting heart rate. Soursop leaves are perhaps most famous for their cancer-fighting potential. A groundbreaking study published in the journal Cancer Letters examined how pancreatic cancer (PC), which is notoriously difficult to treat, responded to soursop leaf extract in vitro. The results were quite impressive. Soursop, referred to by the common name of graviola in the study, killed PC cells by inhibiting their cellular metabolism. The study concluded that “Graviola extract inhibited multiple signaling pathways that regulate metabolism, cell cycle, survival, and metastatic properties in PC cells. A tea brewed from soursop leaves was shown to be effective at killing parasitic larvae and their eggs. Soursop tea was also shown to be effective against debilitating protozoal infections. This could be an important breakthrough, as pharmaceutical treatments have become less effective due to antibiotic resistance and can have a negative impact on your health. Extracts made from soursop seeds can also act as a potent insecticide. The larvae of the Aedes aegypti mosquito, the primary vector of dengue, are vulnerable to soursop seed extract. It also can kill fruit flies and other insects. The soursop fruit’s green leathery skin is covered in small thorns, but despite its somewhat severe appearance, with a few well-placed cuts, soursop can be peeled with little effort. The pulp is fibrous, milky white and contains distinctive black seeds, while the skin is bitter. It is advised, however, that one removes the mildly toxic seeds before eating. Soursop is often used as a blended ingredient. You can extract soursop juice by pressing the deseeded pulp through a sieve, colander or cheesecloth. The United States Department of Agriculture National Nutrient Database estimates that one cup of raw soursop contains over 30 grams of sugar and seven grams of dietary fibre. Soursop contains very little fat but is loaded with potassium. In Central and South America, the soursop tree is a fixture on the landscape. The tree can thrive in poor-quality soil and flourishes in low-lying areas. In some regions, soursop is considered an invasive species. This may change as more people become aware of its extraordinary and unique disease-fighting potential. Soursop is most often used as an ingredient in sweets, but the leaves contain the highest concentrations of the potentially cancer-fighting annonaceous acetogenins. However, teas and solutions made from soursop leaves are extremely potent and can interfere with any medications you may be taking. Concerns have been raised about the toxicity of extracts derived from the leaves of this amazing plant, so if you intend to use a soursop extract, please consult with a health professional first.